Braising meats can seem like a lot of work, but it is very worth it when you do it right. 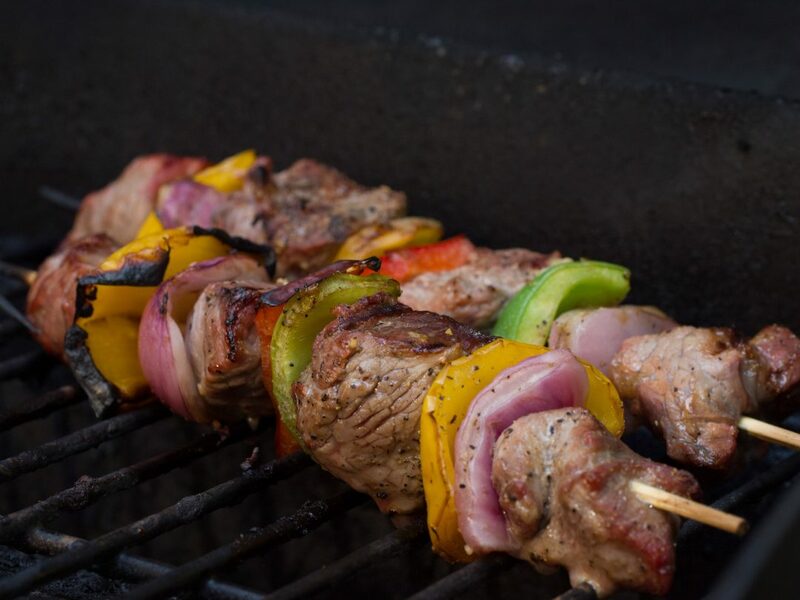 By taking your time and developing flavor through browning the meat and vegetables you will end up with much more flavorful meat. This recipe also involves a night in the refrigerator, so plan ahead for best results. After the ribs are seared remove from the pan and add bacon until it starts to brown. Next add the onions and cook until well caramelized. Then add the celery and carrots and caramelize them as well. This will take at least 15 minutes. If the bottom of the pot starts to get too dark, I recommend covering the pot and turning the heat off. After ten minutes the bottom of the pot will be able to be scraped clean with a wooden kitchen spoon. Then continue browning the vegetables. Next add the aromatics (garlic, thyme, bay leaves) and the tomato paste. Cook the tomato paste out for a few minutes, stirring constantly. Add the wine and allow to simmer for 30 minutes until it is reduced by half. Add the chicken stock and the short ribs back to the pot. Be sure the liquid covers the shortribs, if you need to add a little more chicken stock or water that is fine. Cover with a tight fitting lid and bring up to a simmer. 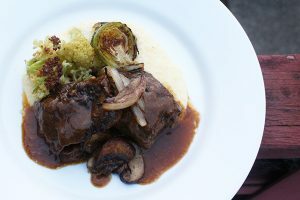 Cook the short ribs for 3 hours either in the oven at 275 degrees, or over a very low flame. The next day, remove the hard cap of fat that formed overnight, and remove the short ribs from their liquid. If done correctly, the liquid will be like jelly and you will have to scape it off the ribs as you pull them out. Heat the liquid that remains until it is fluid and strain it into wide pot. Simmer this until it starts to thicken. This is the sauce for the meat. First, I like to remove the bones and a little bit of the fat on the back of the ribs. This can be removed when the ribs are cold using a pairing knife. Be sure to retain the meat that is between the bones. Then to warm the short ribs, first cut the ribs into pieces about 2” X 2” and put them in a saute pan. Pour sauce over them until it comes about halfway up the sides of the rib pieces. Put the pan in the 375 degree oven and baste the ribs with the sauce every 5-10 minutes until the ribs are hot and have a nice glaze on them. Serve with mashed potatoes and roasted Brussels sprouts.